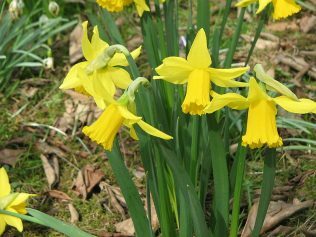 Whatever, you do this month by a sack of daffodils and plant them on your allotment – try to get the early flowering ones, such as February Gold – as their cheery heads will be a welcome site on a cold day at your allotment. Just scatter them on the ground and plant them where they land (they will look better “random”), twice their depth, and leave them to do their thing. I used to add bonemeal, which adds phosphorus and helps with root formation, when I planted my bulbs, but foxes and badgers just love the smell and dig them up. They seem to flower fine without it and you can always give them a liquid feed once they have died down in the spring to help them store energy for next year. If you are buying an assortment of bulbs, keep about five back of each variety and take them home and grow them on – that way you can label those bulbs and it will remind you of the varieties you planted at the allotment. If you have a cold frame, greenhouse, or conservatory at home, you can get some early blooms by forcing them to flower sooner with a little bit of protection under glass. 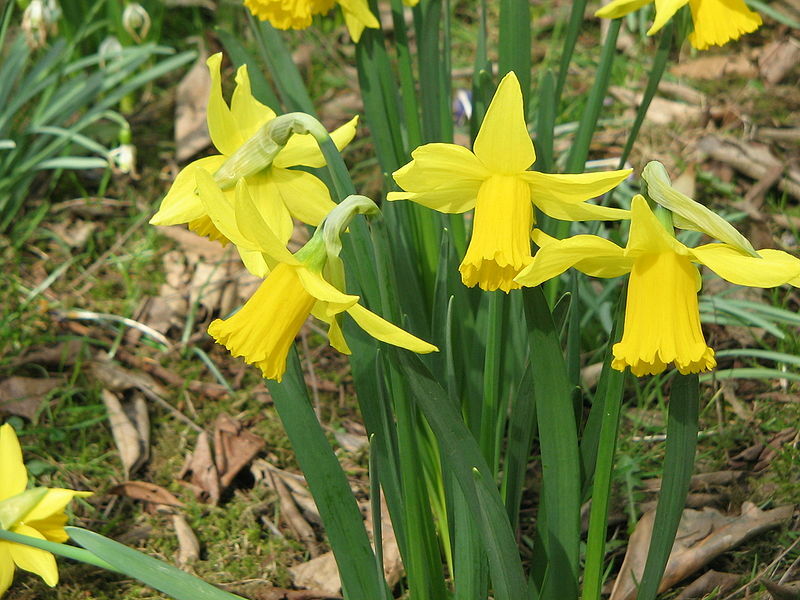 Look out for “Bulb of the Year” which is the beautiful Narcissus (that’s the latin name for daffodil) ‘Thalia’ – it has dark green, strap-shaped leaves and pure white trumpet shaped flowers and looks wonderful planted in grass, but it is just as good in a pot. Tulips are fantastic spring bulbs, especially if you like cut flowers. There is nothing to beat them, for scent, colour and drama. If you want them last for at least two months starting in the middle of March and continuing until the Alliums flower in May then you will need to do some planning. It is such a lovely task on a gloomy evening to sit and look through the bulb catalogues and choose and plan your show! Combining your tulips with spring flowering biennials, such as the deep red wallflower Erysimum ‘Blood Red’, or the orange, E. Fire king, or honesty, Lunnaria annua will give a fantastic carpet of colour. Plant some tulips for an early display, the Fosterianas are good, they have big flowers, and don’t forget the tall stemmed tulips like ‘Purissima’ or ‘Flaming Purissima’. The Fosterianas are great in pots and they flower in March and early April. The species tulips such as Tulipa bakeri and T. clusiana also flower early in the year. ‘Prinses Irene’ is an early tulip with gorgeous orange flowers, that have crimson and red streaks. Next come the Triumph tulips and these will give you the earliest of the deep reds. A mix of ‘Jan Reus’, ‘Queen of Night’ and the lovely deep purple ‘Recreado’ look sensational together and will flower around the middle of April. The beautiful Parrot tulips come into bloom in the middle of spring and the form ‘Rococo’ looks brilliant with lettuces or the blood red Erysimum. This is a great tulip for forcing and if you plant them in pots under cover you can manipulate them to flower by the middle of March. The next ones are my favourites, the lily flowered tulips and one of the most scented is ‘Ballerina’, it is such an elegant tulip and looks wonderful with ‘Black Hero’, which is a double late form of ‘Queen of Night’ – it’s double flowers look peony like – there is a huge range of lily flowered tulips, ‘West Point’, ‘Burgundy’ and White Triumphator’ and Christopher Lloyds favourite,’ Queen of Sheba’ to name but a few. Then finally to end the show some of the green-splashed ‘Viridifloras’ are long lasting and often flower year after year, which is a bonus. The Parrot tulips, ‘Flaming Parrot’ and ‘Orange Favourite’ should see you through to the middle of May when the Allium ‘Purple Sensation’ is poised to take over. The best time to plant tulips is after the first frost, or preferably frosts as it will kill off any left over fungal spores which are left in the ground, and is a good organic gardening method for getting rid of tulip fire, (Botrytis tulipae), something that you really don’t want in your garden as it will kill all your tulips. Try to plant your tulips at least 20cm/8” deep as this will ensure that any spores near the surface will not infect your bulbs. At the Garden House we will have some bulbs for sale so drop by on Friday afternoon between 3.00 and 6.00pm for a slice of cake, a cup of tea and buy some bulbs to brighten up your spring allotment. We can also advise you on planting and general care.